Very few menus are geared toward meeting the dietary needs of anyone who can walk in the doors. Chipotle is a national chain that manages to be accessible to people from all walks of life, following whichever diet they choose. There are a few locations in the capital region of NY. I recently visited the location in Stuyvesant Plaza in Albany, NY. I was waiting for Cassie to arrive, so I stood outside of the store and tried to figure out what was going on and at least 3 people tried to open the doors to Chipotle and looked at me when they couldn’t pull them open. Truth be told, the left door was locked, and the right one was so difficult to move, I felt like I was getting a killer lat workout when I went to open it. If you’ve ever ordered at Chipotle, you know it’s a high stress situation. The people working there are always one step ahead of you and almost never listen to what you say. On this trip, I got up to the counter and told the guy, “Burrito bowl, black beans, no rice, double chicken,” and, of course, the guy had already mock scooped a spoonful of rice into the bowl the second I said “bowl.” Once he was done dispensing the chicken, his hand was already on a spoon for mild salsa as he said, “Salsa – mild, medium, hot, or corn.” If I was not quick enough to blurt out, “hot and corn,” I would have to eat their chunky, bland mild salsa on my burrito bowl; so I did, and crisis was averted. I always get sour cream and cheese, and always say, “add guacamole.” As these words were coming out of my mouth, the guy said, “guacamole is $1.79 extra, is this ok?” and before he could say the first “is,” I yelled, “YESSSSSS! !” I got a diet soda, paid my $10 and change and went to sit down facing the front door. Those people really need to slow down. 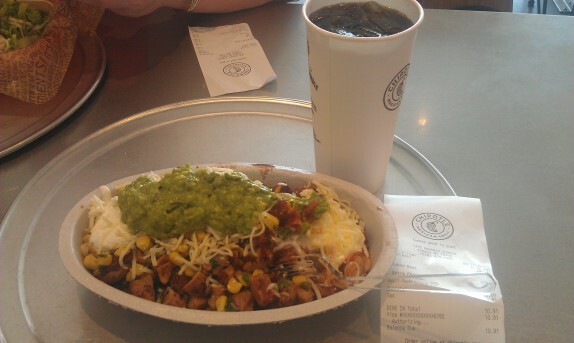 As I destroyed my burrito bowl, I laughed as other people had trouble with the door. C’mon, why did one door need to be locked? Why do places to this? Also, why is the door that is open so darn heavy? I don’t get it. I like how each bite is unique. 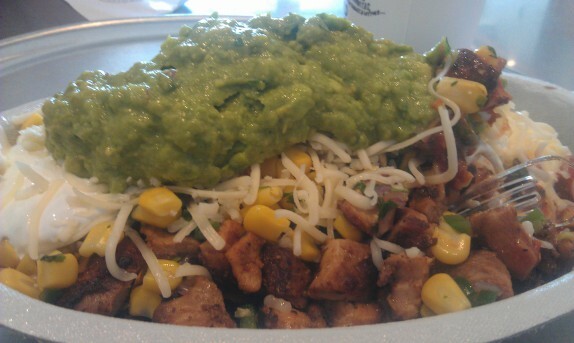 Most bites of my burrito bowl consist of some of everything, but sometimes it’s just corn and beans, sometimes it’s guacamole and cheese, you know, variety. What I like about this, besides it being exactly how I like to eat while I’m training, is that the flavors of everything are clean. The chicken is seasoned with earthy spices which creates a great base for the dish. The black beans are relatively unseasoned, but, coupled with the salsas and sour cream, it helps to bring the flavors and textures together. I’m not exactly sure where they’re getting their sour cream, since it’s way thinner than any sour cream you will purchase in a market, but it tastes pretty good. Their cheese is akin to a mild cheese like a mozzarella. Even if I weren’t training, I would probably still order the same thing. I used to get burritos, but their rice is terrible. They add cilantro and some other stuff to it, rendering it inedible. Their chips are also a sad excuse. They come from a box and are given to you in a paper bag; they’re sprayed with a lime salt that takes them from bad to putrid. They also charge a significant amount extra for salsa, mediocre at best salsa. And that’s why I stick with what I like. Good to know. I have yet to try Chipotle and honestly – a stressful ordering situation is enough to keep me from patronizing any restaurant. In defense of Chipotle, Moes is no better with the stress of the ordering, depending on the kid you get.